Recently, a fellow LJ posted that he was going to get a set of LN holdfasts. There were several posters to that thread that were pretty outspoken as to LN’s choice of material for the holdfasts; cast ductile iron. The OP of that thread sent a message to Chris Schwarz asking for his opinion on the LN holdfasts and he replied that they were quality items. I own several other LN products and was pretty sure that LN was absolutely not going to manufacture, market, and sell an item that was anything but a high quality product which is inline with everything else they sell. So I ordered a set to replace my Grammercy Tools holdfasts. Now, the Grammercy ones are also quality, and I only have one complaint about them. Their design is a large curved holdfast made from steel wire. 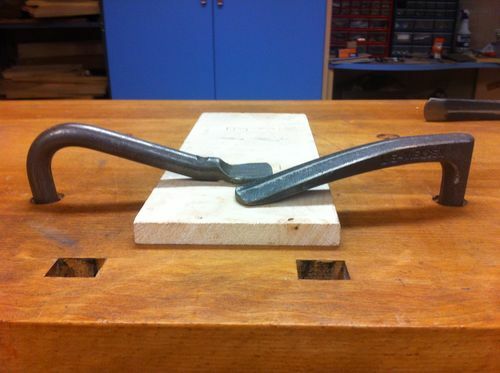 This large curve makes the point of impact for a hammer blow to release the holdfast at close proximity to the benchtop. This has caused me to strike the top of my benches a couple of times with my hammer, leaving a pretty good divot in one of them. I felt (and was correct) that the shape of the LN holdfasts would raise that point of impact a little higher on the bench. This makes a lot of difference when holding a thin board with them. Additionally, the curved shape of the Grammercy holdfasts have caused me a couple of deflections which were thankfully uneventful. The shape at the point of striking to release the LNs is much more predictable and is slightly higher above the surface which should end striking the benchtop. The shafts of the LN holdfasts are left mostly rough cast which provides a no slip surface inside the dog hole on the bench. 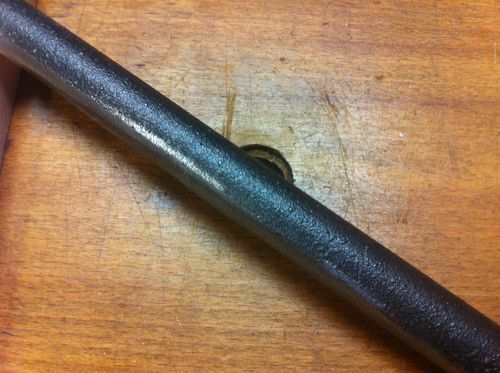 Though I never had a problem with the Grammercy ones, I have heard of others who had to use sandpaper to scratch the shafts on them to provide better grip. The LN also has a nice smooth pad on the tang where it holds the wood down. I have yet to try it on some soft wood like pine to see if it marks it up, but I will be installing hard felt pads on them anyway. I did the same with my Grammercy ones and never had an issue with scarring wood. Lastly, for all the critics of the choice of material, cast ductile iron, have no fears, this holdfast isn’t going to break. I pounded the heck out of one of them. I am talking way above what I would need to do for holding wood. My holdfast hammer is one I made from a big block of beech with 1/4” brass plates on each end. It is a heavy hammer and is capable of some pretty forceful blows. That holdfast took it like a champ! Knowing LN will replace a tool if it breaks, I took no mercy on that thing and it did not disappoint. 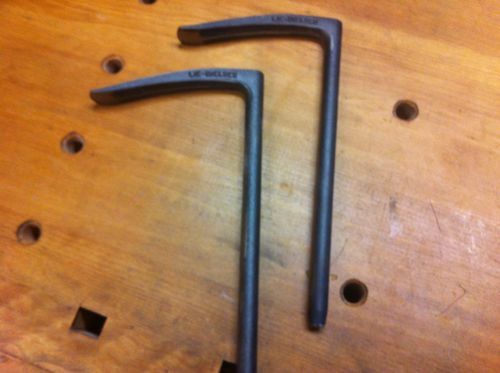 In summary, these holdfasts are typical of the rest of the high quality tools sold by Lie-Nielsen. They were packed nicely when shipped and it took six days to receive them after I ordered them. They are made in the great state of Maine, USA. I am sure these will last me a lifetime. Now who needs a set of Grammercy holdfasts? Here you can see the differences in the shapes of the two types of holdfasts. Nice tools and I’m sure they’ll last you a lifetime. I use the Veritas hold down myself, but I’ve considered buying a couple of traditional holdfasts. If I do, I’ll likely buy these as I’d have no concerns about their quality. Thanks for the review. John, I have had my eyes on the Veritas ones for awhile. Pop Woodworking (ala Schwarz) just did an article on holdfasts and he noted that while traditional holdfasts are quicker to use, no other is as predictable as the Veritas. I see me getting one someday. And Veritas is a very fine quality tool maker as well. Very nice review, Mike. I was curious about the LN holdfasts—I thought the choice of material was strange, but I also have much confidence in LN products and, like you, knew they wouldn’t release something that could break easily. Though I have the Gramercy ones and are very happy with them, I must admit that the LN holdfasts are much more aesthetically pleasing. They should serve you well for a very long time. Thanks again for the review. I think the best thing about the LN ones is that there is now a larger selection of quality holdfasts in the market. And that is great for all of us. Mike, thanks for the review. Much appreciated. Hey Mike – great review! Might I ask how thick your benchtop is? Perhaps it was mentioned, but I’m too dull to find it! carguy460, I did not put that on the review, thanks for bringing it up. That is a useful piece of info. My top is 2.5 inches thick where the holdfasts are used.